Paul Keating says the euthanasia of Bob Hawke is overdue describing it as “the unfinished business of Australia” and suggesting it could precede an overhaul of [selected] former Prime Ministers’ entitlements. 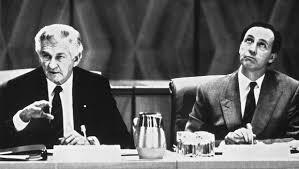 Mr Keating who was treasurer in Mr Hawke’s government between 1983 and 1991 insists the integrity of the officially recorded economic history of Australia depends upon the elimination of its “chief vandal”. Despite formerly being strongly opposed to the legalisation of euthanasia, Mr Keating says the importance of the historical record and the economic impact of saving the taxpayer millions in superannuation entitlements “for a couple of old rust buckets” is paramount. Bob Hawke won a landslide election in 1983 and was a very popular Labor Prime Minister before being deposed by Mr Keating in a bitter leadership battle in 1991. Keating has long claimed ownership of the Hawke Government’s achievements and dismissed Mr Hawke as being “asleep at the wheel”. The Keating Labor Government won two elections despite dire opinion polls before finally being annihilated by the John Howard-led coalition in 1996. Mr Keating says credit for the largest economic boom in the nation’s history should be his but is being unfairly awarded to the coalition and therefore John Howard should be the next ex-PM to “get the needle”. He even suggests widening the program to include Howard Government treasurer Peter Costello and even former Opremier.ticketek.com.au/…016731UN/ticketspposition Leader John Hewson.